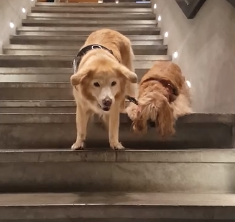 the golden retriever dog named Ginger, takes it one step at a time, the blind dog called Kimchi, carefully follows. The video shows the true refashion ship , love and the clear bond and trust the pair have built up. But it wasn’t all planned for Ginger to become Kimchi’s guide dog – it all happened by accident at first. Their owners initially tied the dogs’ leads together just so Kimchi wouldn’t wander off – but Ginger naturally started leading the spaniel around, as well as walking and waiting patiently next to her. Now it’s like ‘no show without Punch’ – the pair never go anywhere without the other by their side. Love how not only is he guiding, but also protecting and making the blind one feel secure by standing to the right side. Every step the blind dog takes he can feel the other dogs body preventing a fall. heart warming. These videos can even give life to broken frozen tattered hearts. it always amazed me, how loving, and useful animals are to each other, I can`t understand some people when they say they don`t like dogs, animals, perhaps thats`the reason some days I prefer animals to people!